Republican and Democratic members of the U.S. House of Representatives introduced a bill on Wednesday that would require President Donald Trump's administration to provide a detailed report on North Korea's nuclear program to set a "baseline" for progress on talks with Pyongyang. A resort island off Singapore that once housed a prisoner of war camp run by wartime Japanese forces and was called "Rear Death Island" is the venue for Tuesday's summit between U.S. President Donald Trump and North Korean leader Kim Jong Un. Japanese Prime Minister Shinzo Abe, seeking to draw on his close ties with President Donald Trump in talks on Thursday, will urge the U.S. leader not to forget Tokyo's security concerns in his drive for a historic deal with North Korean leader Kim Jung Un. 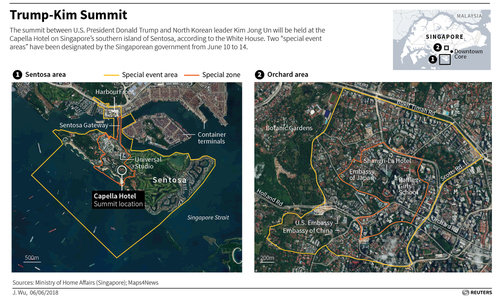 Trump-Kim summit set for Singapore's southern island of Sentosa. It's a holiday hotspot with diversions ranging from a Universal Studios to luxury resorts. But experts say the venue is also a smart choice for security reasons. Singapore airspace will be restricted during the planned U.S.-N.Korea summit, said a notice to airmen posted by the International Civil Aviation Organization (ICAO) and the U.S. Federal Aviation Administration (FAA) on Wednesday. It has been more than 30 years since the identical twin sister of Japanese teacher Misa Morimoto vanished, believed to have been abducted by North Korea. White House spokeswoman Sarah Sanders confirmed on a Twitter post that the venue of the upcoming summit between U.S. President Donald Trump and North Korean leader Kim Jong Un would be the Capella Hotel on Singapore’s southern island of Sentosa. Reuters photographers Edgar Su and Darren Whiteside give you an inside look at the resort island. Russian President Vladimir Putin said on Wednesday a decision by U.S. President Donald Trump to set up a meeting with North Korean leader Kim Jong Un was "brave and mature", and said that he was expecting a "positive outcome". G7 leaders will call on North Korea on Friday to get rid of its nuclear weapons if it wants sanctions against the country to be lifted, a senior European union official said on Tuesday. U.S. President Donald Trump and North Korean leader Kim Jong Un's summit next week will take place at the Capella Hotel on Singapore's Sentosa Island, White House spokeswoman Sarah Sanders said on Tuesday. Singapore on Tuesday added its southern resort island of Sentosa to a special event area designated for next week's summit between U.S. President Donald Trump and North Korea's Kim Jong Un, the government said in its online gazette. Singapore on Tuesday unveiled a commemorative medallion ahead of next week's summit between the U.S. and North Korean leaders in the wealthy city-state, carrying the inscription 'World Peace' in large letters on one side. The White House said on Monday its policy of tough sanctions on North Korea has not changed, days after U.S. President Donald Trump said he no longer wanted to use the phrase "maximum pressure" to describe the campaign to press North Korea to give up its nuclear weapons. North Korea's new top three military officers are known for their unquestioning support of leader Kim Jong Un and are flexible enough to accept the massive changes that may come from any deal with U.S. President Donald Trump, people who follow the secretive country say. Top Senate Democrats on Monday told President Donald Trump not to make a deal that leaves North Korea with nuclear weapons, and threatened to maintain or toughen sanctions on Pyongyang if that condition is not met. The U.N. atomic watchdog is confident that it is best placed to verify any nuclear deal reached with North Korea and would be able to deploy quickly, the head of the agency said on Monday. North Korea’s top three military officials have been removed from their posts, a senior U.S. official said. Reuters' Josh Smith explains how that may connect to a high-stakes summit in Singapore between leader Kim Jong Un and U.S. President Donald Trump. Singapore has designated a central region of the wealthy city state as a "special event area" from June 10 to 14, for the planned summit between U.S. President Donald Trump and North Korean leader Kim Jong Un, the government said on Monday. Nobel Prize winning anti-nuclear campaign group ICAN has offered to pay for the cost of the historic summit between North Korean leader Kim Jong Un and U.S. President Donald Trump, including the hotel bill for the impoverished state's leader. 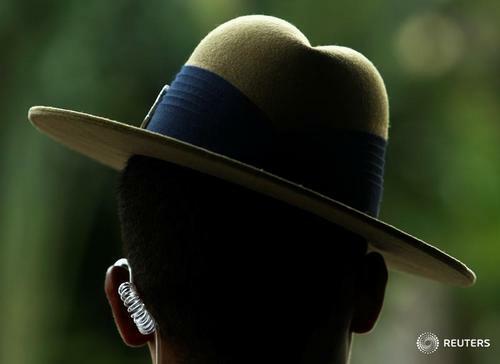 North Korea's top three military officials have been removed from their posts, a senior U.S. official said on Sunday, as U.S. President Donald Trump and North Korean leader Kim Jong Un prepare to meet on June 12 in Singapore. U.S. Defense Secretary Jim Mattis said on Sunday North Korea will receive relief only after it takes clear and irreversible steps to end its nuclear program, adding it would be a bumpy road to a summit between U.S. and North Korean leaders. U.S. President Donald Trump, in a complete reversal, said on Friday he would hold a summit with North Korean leader Kim Jong Un on June 12 in Singapore in the latest twist in the high-stakes diplomacy over eliminating Pyonyang's nuclear arms program. U.S. President Donald Trump, after meeting with a senior envoy from Pyongyang, said a planned summit with North Korea's leader Kim Jong Un was back on for June 12 in Singapore. U.S. President Donald Trump will meet with a senior North Korean envoy on Friday, the White House said, as efforts continued to get a U.S.-North Korean summit initially planned for this month back on track. The two Koreas agreed at a high-level meeting on Friday to hold talks this month on military issues and reunions of families divided by the 1950-53 Korean War, they said in a statement. The two Koreas agreed during a high-level meeting on Friday to hold talks later this month on military issues and reunions of families separated by the Korean War, a joint statement said.